The islands of the San Blas Archipelago are strung out along the Caribbean coast of Panama from the Golfo de San Blas nearly all the way to the Colombian border. 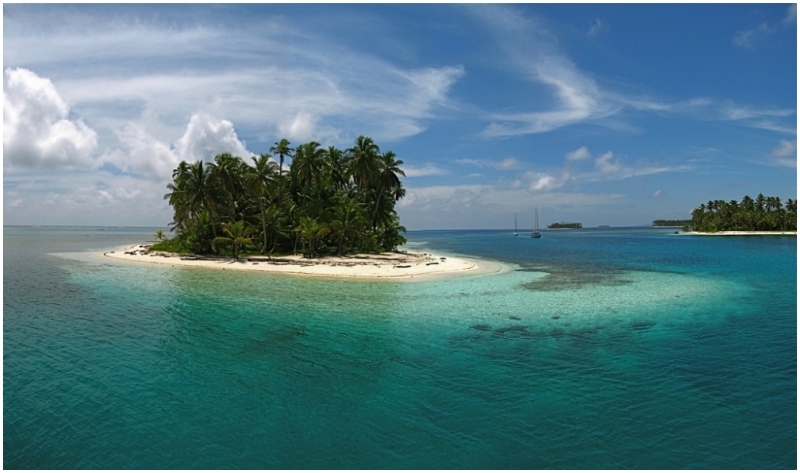 San Blas is a series of 378 islands of which only 49 are inhabited by the fiercely independent Kuna Indians. Although only a 20-minute plane ride away from Panama City, a trip to the San Blas islands will transport you 20 centuries into the past. The Kuna Indians, who run all the islands as an autonomous province, with minimal interference from the national government have maintained their own economic system, language, customs and culture, with distinctive dress, legends, music and dance and thus have avoided traditional tourism development. The economy of the islands is based on coconut sales, fishing and tourism, and they offer travelers good snorkeling, diving and swimming. Facilities are few and simple, as is the food. The area is surrounded by reefs, some of the oldest in the world, and offer wonderful diving and snorkeling opportunities, the best of which are between the months of April and June. San Blas is famous for one of its arts and crafts, the mola. Kuna women make rainbow colored fabrics, emblazoned with fish, birds, jungle animals and geometric designs that would impress Picasso himself. The men still fish from canoes as they did before Columbus came. They still run up to the corner coconut palm trees for something fresh and cool to drink each morning, just as they have for untold centuries. The most interesting islands are Achutupu, Kagantupu and Coco Blanco. There are flights to several of the islands from Panama City or you can catch a ride with Kuna merchant ships from Colón, who will find the perfect island for diving and snorkeling pleasure.